It was the first time I visited Ahmednagar. It was here that I discovered a new meaning of Sweet and Spicy food. Ahmednagar is around 122 kilometres from Pune. It is on the Pune-Aurangabad highway. Ahmednagar is a small place but is important because people travelling from Pune to Shirdi have to cross Ahmednagar. I stayed at Hotel Paradise in Ahmednagar for 21 days for my business work. The restaurant in the hotel is quite happening place. It used to be difficult to get a table in the restaurant at the peak hours of dinner during 9 to 10 in the night. It was here that I discovered many Maharashtrian dishes that I was devoid of being a north Indian and a resident of Delhi since my childhood. It is here I tasted Masala Papad for the first time in my life. To my surprise, I found this masala papad quite sumptuous and tasty. It is a big papad on which there are a lot of small cut pieces of onion, tomato, sev etc. is spread. It was really tasty. The hard bottom of papad with the topping of all this stuff created a unique kind of taste and I became a fan of it right from the day one. Similarly, it was here that I tasted Sweet and Spicy Chicken Keema for the first time. It was not that I was having Chicken Keema for the first time but so far it was never sweet but only spicy. 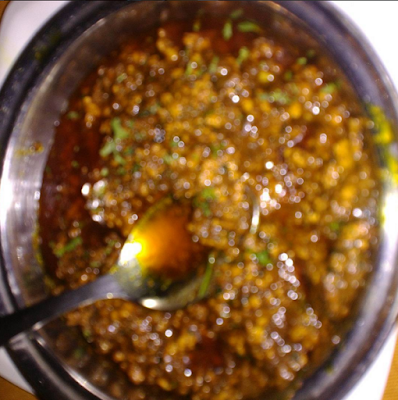 This particular Sweet and Spicy Chicken Keema had a different flavour and taste. I got curious and met the chef there. When I enquired about the ingredients of the dish, it was amazing to know that they put all kind of spices in it but in a very systematic and in a balanced quantity. For sweetness, they don’t put sugar but honey. That is what made is completely awesome. Each portion of Sweet and Spicy Chicken Keema was performing some balancing act in my mouth as soon as it touched my tongue and taste buds. The spices even on the excessive side were balancing well with the small portion of honey mixed in the dish and was giving a feel of having a sumptuous meal. That was some kind of best form of fusion balanced with perfection and precision. In fact, this experience prompted me to taste a new dish every day at a place I visited for the first time in life. This created a permanent curiosity factor about sweet and spicy food and gradually I found that the concept is quite popular in many parts of India and across the world. The orthodox recipes are being replaced with innovative one to explore new horizons in food arena thus evolving entirely different food tastes. The onus of this magic lies with the chefs who dare to cross the barriers and get empowered to build such innovative recipes. The art of cooking is changing fast, I observed, when I got to know about this concept explored by two veterans Vir Sanghvi and Vikas Khanna. The video is a must watch where the sweet and spicy dish passes through multiple processing like margination, frying, baking, roasting, chopping, etc. You will also get passionately curious to try this innovative recipe involving roasted chicken topped with chocolate sauce. Just watch the #Foodventures videos by Vikas Khanna and Vir Sanghvi.